Harlingen CISD Robotics teams surpassed the competition at the FIRST Tech Challenge League Championship held Saturday, February 4, at PSJA Southwest High School. More than 40 teams from across the Rio Grande Valley assembled to battle for the coveted championship title. 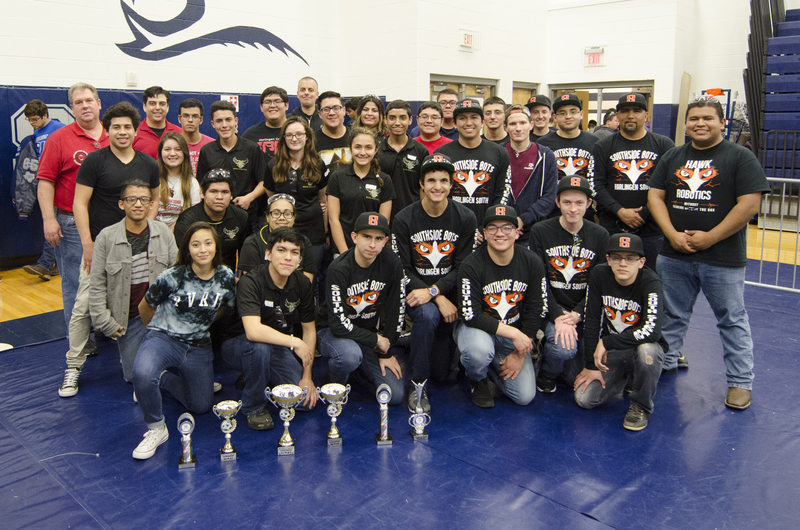 Early College High School, Harlingen High School South, and Harlingen High School took first, second, and third place respectively. The final team rankings were based on points accumulated throughout 15 matches. As first-time participants in FTC, team members took the initiative to teach themselves the skills they needed for competition. Lopez, in turn, shared her knowledge of programming with ECHS senior, Angel Barrientos. Teams were randomly divided into three leagues – Red, Silver, and Blue. ECHS and HHS took first and second place respectively in the Blue League while HHSS finished first in the Red League. Going into the competition, HCISD Robotics teams were primarily focused on growing their skill set rather than on winning. To their surprise, they were named among the top teams in the RGV. Following the philosophy of “continuous improvement” which is cleverly captured in their team name – Kaizen Cards – Lopez wants her team to take advantage of every opportunity to continue to build upon their skills. Those advancing will compete in the Alamo FTC Regional Championship which will be held at Veterans Memorial High School in San Antonio on February 23-25.